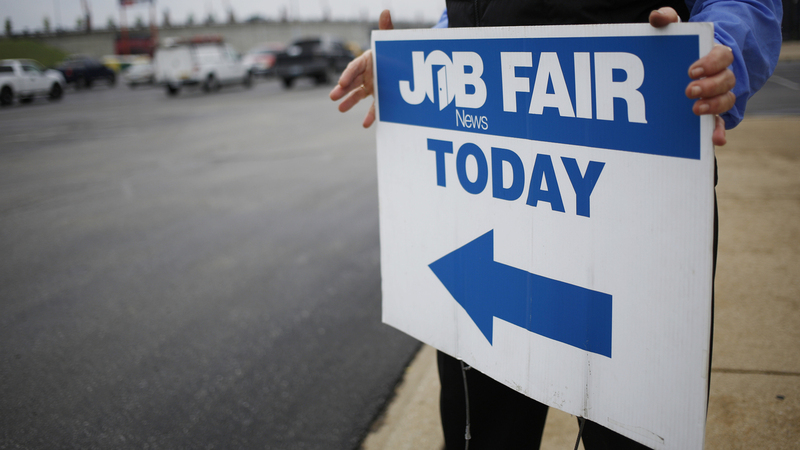 U.S. Economy Adds Just 38,000 Jobs In May, Far Short Of Expectations : The Two-Way Economists had anticipated 160,000 new jobs, even factoring in a large strike by Verizon employees. Meanwhile, the unemployment rate declined because of people dropping out of the workforce. A Job News USA employee directs job seekers to a career fair at Papa John's Cardinal Stadium in Louisville, Ky., on May 18. New figures from the Bureau of Labor Statistics show that the number of workers who would like to work full-time but can find only part-time work increased by nearly half a million last month. The number of workers who would like to work full-time but can find only part-time work increased by nearly half a million, to 6.4 million, the BLS says. Economists had anticipated 160,000 new jobs last month, and even that was seen as "not a very high number," NPR's Yuki Noguchi reported. But it would have been enough to keep up with population growth. The actual growth of 38,000 jobs falls far short of that standard. A recent strike by Verizon workers pulled the jobs report down somewhat, as was widely expected: More than 35,000 workers were off the job and counted as unemployed for the sake of this month's report, Reuters says. The mining and manufacturing sectors continued to show job losses, the BLS says, while the healthcare sector is still adding jobs. The BLS also revised downward the job gains for the last two months. Growth for March was revised from 208,000 to 186,000, and for April from 160,000 to 123,000. April's job growth had already been regarded as weak, even with the original numbers. This month's jobs report is being closely watched for clues to when the Federal Reserve will raise short-term interest rates, as part of their plan to gradually return rates to normal levels after years at nearly zero. The Fed meets in two weeks, and then again in late July, The Associated Press reports. The weaker the report, the more likely the Fed is expected to wait a while before the next rate hike.